In our Monkey Business series, we sit down with internal communications pros, HR top-performers and email gurus to get the best tips and tricks to engage employees, fix your culture, and help you improve business performance. If you’re in the internal communications game, odds are you’ve heard of Advita Patel. Besides being the Internal Communications Specialist at the UK’s Nuclear Decommissioning Authority, she has her own internal communications blog, IC Words, where she shares best practices for up-and-coming and seasoned IC professionals. She was also recently named in the Northern Power Women Future List, and is the Vice Chair for the Chartered Institute of Public Relations Inside group (CIPR Inside) the Internal Communications committee for CIPR UK. 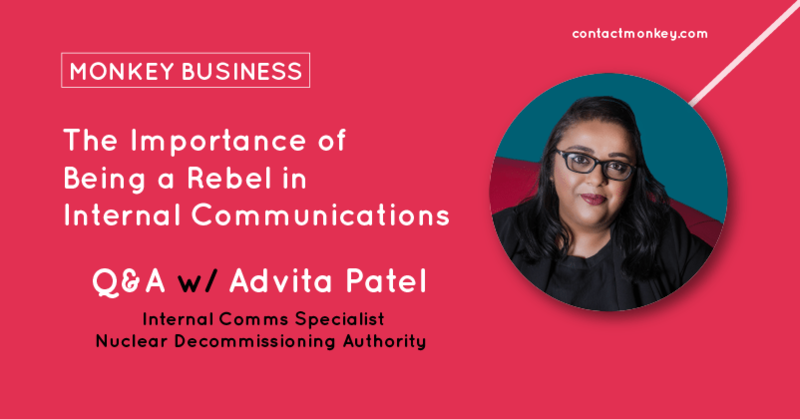 We had the chance to chat with Advita about the state of internal communications, what we in the industry could be doing better, and about the importance of being a rebel in communications. Let’s get into it! 1) You’ve worked in internal communications for more than a decade — what initially captivated you about the profession? What’s changed in recent years? Funnily enough, I never intended to have a career in internal communications and I fell into it whilst I was completing my masters in Strategic Marketing. But as soon as I started working within that field, I knew straight away that I’d finally found my calling in life. I love that I get to work with so many different people from across the organization, it’s one of the things that initially captivated me about IC. I also love the fact that with Internal Communications I get to explain, excite and empower colleagues from across the organization to be the best they possibly can so they feel motivated to continue working hard for the organization and delivering great results. Employees can be the biggest advocates for the business and I think sometimes people forget that! Lots of things have changed in recent years, but one of the most important changes I’ve seen is that the profession is moving away from being a ‘nice to have’ to a ‘must have’ in many organizations. There is still quite a lot of work to do to show that we are much more than just sending out messages or making presentations look pretty but we are getting there slowly! 2) Recently, you’ve written about the importance of “being a rebel” in IC — what does that mean? How can those in the profession start being a “rebel”? For me being a rebel in IC is about standing up for what you believe in and challenging the norm so you can start adding real value to the organization. We are busy people with what seems like a never-ending to-do list so we rarely have the chance to think about what we are doing and why we are doing it. It’s common nature for most people in IC to be helpful, to be the problem solver, the fountain of knowledge or the person people go to if they are not quite sure where to go – which is absolutely fine – but if you keep doing the same things in the same old way then you can’t expect anything to change. Call out your inner rebel to start asking yourself why you’re doing certain tasks such as sending out info about ‘Patty’s leaving Party’ or spending hours formatting a presentation. There’s no denying that you will get a ton of gratitude from the person you’re helping but ask yourself how much value that’s adding to your role. Once you start pushing back a little, and challenging things that are not adding anything to the business, you’ll see a shift in attitude and better results for you and your team. 3) On that #commsrebel note, how can internal comms pros stay authentic while also adhering to their company’s tone and voice? One of the great attributes internal comms pros have is that we generally have quite a high EQ (Emotional Quotient) and like chameleons we can adapt quite well to different environments as long as we believe in the overall values of the company. The company’s tone and voice should be aligned with the leaders of the organization which is why it’s so important that Internal Communications pros have a strong relationship with the C-Suite. If their personality, such as tone/voice, isn’t reflected in the corporate lines you are sending out then authenticity is not there, and trust will disappear. You need to remember bricks and mortar don’t have a tone or voice that sits with the leaders in your org, so if they change, so does the tone and voice, which is different from brand values, which would generally remain the same. However, if you feel like your values or ethics are being compromised and you are unable to influence change then you may need to think whether that organization is for you. Working somewhere where you don’t agree with their values can cause an inner battle with your authentic side – which in the long-run can leave you exhausted and feeling a bit sad. 4) You also have an IT background with a strong data analysis foundation. How important is data analysis and measurement for IC pros? What quantitative and qualitative data should IC be looking at? So important! I always get on my soap box about this, but analysis and measurement should be a standard in every piece of work you do. If you don’t have any measures in place then how can you see what value you’ve added and the difference it’s made to the organization? I’ve had many conversations with IC pros about the challenges facing them when it comes to measurement but it’s important to look at different data across the business. So, for example, if you are asked to help with a health and safety campaign then look at the H&S data and the HR Data together. Set targets before the campaign starts and measure at the start, during, and then after to see the difference it has made. As well as outputs such as click through rates, you need to look at outcomes like what behaviours have changed. Hold focus groups to get more qualitative data to find out if the campaign worked, and how it can be improved. Make sure you add this process to your project plan. If done properly, it will give you some rich data that can be used for other things as well. 5) You interact with fellow internal communicators pretty often (including us, thanks 🙂 ). What are internal communicators doing right? What are they doing wrong? What should they change? I LOVE that we have so many advocates for IC and people are starting to shout out about the great work they are doing in their organization. Being able to network and share ideas really helps internal communications pros who are often working on their own, with no team and limited budgets. I know without some of the support I’ve had over the years, I would have really struggled to make traction on various projects and work. But, I do think that we need to stop talking about having this ‘seat at the table’ and start working towards building ourselves as trusted advisors. I know it’s been a bug-bear for many over the years that we are not taken as seriously as our PR friends, but I find working with leaders on a 1-2-1 basis and building trust is more impactful than sitting around a boardroom table. Eventually, once you’ve built your Trusted Advisor status, you’ll be invited in to these meetings without having to push on the door. 6) What do you wish you knew when you first started your career in internal comms? Would you do anything differently? I wish I’d known that it’s actually okay to say no to some things and it won’t impact your career. I used to get some requests that I knew were going to be impossible to achieve but instead of saying ‘That isn’t going to work but here is another solution…’ I flayed around and tried to make the impossible happen, causing a great level of stress and wasting lots of time. Being honest from the onset is much better than going back with an answer you already knew from the beginning. I’m a problem solver so I’m never just a firm ‘no’ but I am realistic and that’s important when you’re working against budgets and fixed timescales. 7) Before we get into email skills, what’s a good human skill every communicator should have? From your “successful peers” (whatever that means to you), is there a common denominator? Definitely resilience and kindness ?. I say resilience because everyone is an ‘expert’ in comms and I can almost guarantee that every communicator has been told how to do their job by well-meaning colleagues. Also, since we are often the ones responsible for comms within the org and the work we do can be quite emotive, we can sometimes be caught in the crossfire (“don’t shoot the messenger” comes to mind) –this can be challenging at times. Early in my career I spent many hours wondering if I was cut-out for IC after quite a few tough meetings, but you need to remember not to take it personally. One of my bosses (and a very good friend) once told me that kindness doesn’t cost anything which is so true. This is even more important considering the times we are now living in. It honestly doesn’t take much to smile and ask people how they are, as it can make such a difference to that person. I used to get so many colleagues telling me about being ignored by leaders when they passed by, which always made me a feel a bit sad – so I always treat people exactly how I’d want to be treated. 8) We love email (we’re an email tool after all)! What separates a great internal email from a bad one? Do you have a favorite example? A great email tells people what they need to know without them having to read reams of text. I’ve seen some pretty shocking examples of emails that are poorly written without any consideration on who the target audience is. If there needs to be an action then tell them what that is, if it’s for information then make sure you’re clear on what they need to be aware of. In one of my previous organizations, we used to tell people in the subject line what action was required and if the email was longer than a couple of paragraphs we added a sentence at the top to summarise. Employees are time poor these days and we’re constantly fighting for their attention against all the other things they have access to on their own personal device, so don’t make things harder than they need to be. 9) Can you name some of your favorite internal comms resources/content pieces? We love sharing those with our audience. – www.allthingsic.com – Rachel Miller is one of the gurus of IC I totally respect. Her blog was one of the first I’d come across and she really helped me when I first started out in my career. She’s genuinely one of the nicest people I’ve met and I religiously follow her blog for inspiration. – www.redefiningcomms.com – Jenni Field is an expert in seeing things differently within comms. Her articles and the insights she shares are mind-blowing. Her piece on neuroscience is a must read. – http://ellaminty.com/ – Ella Minty is someone I’ve been ‘following’ on Twitter for a while and I absolutely love her blog! She also hosts a Twitter chat every Wednesday called #powerandinfluence, which is fantastic. – www.ciprinside.com – #ICBookClub – I’m a bit biased here as I’m the Vice Chair for CIPR Inside but their #ICBookClub is such a great resource for anyone who enjoys a good book and is looking for something a bit different. We then discuss the book during a live twitter chat, which is normally every other month. – www.ioic.com – The Voice Magazine is fabulous and well worth the membership subscription alone. It’s full of articles, insights, research and thoughts from various Internal Communicators – a fantastic resource for any Internal Comms Practitioner. Spending time with friends and family is definitely my happy place. A few weeks ago we had a huge family getaway to a manor house in the countryside, which was fantastic. One night my cousin decided to plug in the sing star karaoke game which pretty much involved all of us trying to outdo each other by singing as badly as possible. It was so bad that the person we rented the house from texted to say the neighbours (who, by the way, were at least 3 miles away) heard a lot of shouting coming from the house. One of the best laughs I’ve had in a long time – suffice to say I don’t think I will be giving up my day job to set up residency at Caesar’s Palace any time soon! Let us know what you thought of our chat with Advita. If you want to add to the conversation or share your internal comms tips, tweet at us with #MonkeyBusiness! If you wish to learn more about our plugin and how it helps you seamlessly import HTML emails ? right into Outlook without rendering issues, we can set you up with a personalized demo. Just click on the button below to book your demo. ?